TV doc Mehmet Oz, who hosts a very popular daily television show, tried to conduct a scientific experiment this week. He wanted to test whether apple juice from some of the most popular juice makers in the U.S. contained toxic levels of arsenic. For some reason - perhaps he was feeling guilty about all the unscientific claims he has been pushing on his show - he decided he would try to prove this scientifically. With all the resources of his TV network behind him, he was able to put on a pretty good show. But Dr. Oz is no scientist, as he made very clear when he presented his "discoveries." His pretend-science act - and that's what it was - was a disaster. I'd have to give him an "F" for his experiment, where he claimed that he had found dangerous levels of arsenic in five popular brands of apple juice: Minute Maid, Apple & Eve, Motts, Gerbers, and Juicy Juice. 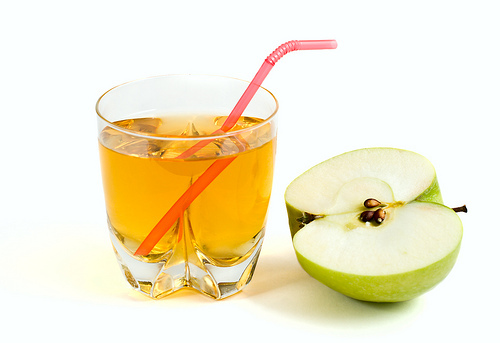 "American apple juice is made from apple concentrate, 60% of which is imported from China. Other countries may use pesticides that contain arsenic, a heavy metal known to cause cancer. After testing dozens of samples from three different cities in America, Dr. Oz discovered that some of the nation's best known brands of apple juice contain arsenic." "As we have previously advised you, the results from total arsenic tests CANNOT be used to determine whether a food is unsafe because of its arsenic content. We have explained to you that arsenic occurs naturally in many foods in both inorganic and organic forms and that only the inorganic forms of arsenic are toxic, depending on the amount. We have advised you that the test for total arsenic DOES NOT distinguish inorganic arsenic from organic arsenic." "it would be irresponsible and misleading for the Dr. Oz Show to suggest that apple juice is unsafe based on tests for total arsenic." But of course Oz wasn't going to go back and check his results. That would be too scientific! Instead, he aired a show in which he wildly overstated the results and the possible risks. He didn't express even the slightest uncertainty about his findings. He interviewed audience members who dramatically confessed that they hadn't realized they were poisoning their own children. The horror! Among other things, Besser said that Oz's hyperbolic, poorly-supported claims are like " yelling fire in a movie theater". Bravo for Dr. Besser. I'm not sure if Mehmet Oz was always the way he is now, but he seems to use his show to sell products (and to sell himself!) rather than to inform the public about medical issues, as one of my fellow Forbes bloggers, Alice Walton, has noted. Dr. Oz has embraced complete quacks, too, notably Joseph Mercola, whom he has had on the show more than once. Maybe Oz was trying to show his science-y side by doing what he thought was a real study, actually measuring arsenic levels in samples of apple juice. But he botched it so badly that he just demonstrated his own lack of serious science cred. Dr. Oz ought retract his erroneous claims about arsenic and apologize for his scaremongering and his sloppy science. But he's showing no signs of that: on his website he is sticking by his claims, and he challenges the FDA and the food companies to come on his show. He's also claiming that the source of the arsenic is pesticide sprayed on apples imported from China, although he presents no evidence at all for that. This is not how science is done, Dr. Oz. You made a claim, and others pointed out major problems with it. It's incumbent on you to come up with better evidence. But somehow I suspect that will be too much trouble for you. Real science can be such a pain that way. Evolution tells us a lot about death. Of course it's about life too, but it's really about survival, which involves both life and death. As most people know, the Black Death was a horrible plague that swept through Europe, Asia, and Africa in the 1300's, killing tens of millions of people at a time when there weren't so many people to begin with. The world's population prior to the plague, about 450 million, dropped to 350 million. About one-third of the entire population of Europe, and half the population of China, may have died. Centuries earlier, the Plague of Justinian in 541-542 C.E. may have killed even more, up to half of Europe and untold millions elsewhere around the world. In ancient and medieval times, people thought the plague was caused by rats, but the true cause wasn't discovered until 1894, when Alexandre Yersin of France and Kitasato Shibasaburo of Japan finally traced it to a bacterium now called Yersinia pestis, which is transmitted by fleas, which in turn are carried around by rats. Gross, I know. But the original plague, the Black Death, has never returned. Why not? A study last year and another one published just this week provide the answer. Last year, Barbara Bramanti and colleagues collected DNA from mass graves dating to the Black Death, and showed conclusively that the victims were infected with Yersinia pestis. Until this study, some scientists were uncertain about whether Yersinia pestis was the true cause, but Bramanti's research should settle that question once and for all. They also showed that at least two distinct strains of plague bacteria infected Europe, each arriving via a different route. Further evidence appears in a remarkable new study published this week by Hendrik Poinar and colleagues. They exhumed over 100 skeletal remains from victims of the Black Death, collected from a ancient London cemetery, East Smithfield, which has been conclusively dated to the plague years, 1348-1350. Using the latest DNA sequencing methods, they identified Yersinia pestis DNA in 20 of the 109 victims. The same thing happened to the "Spanish" flu virus, the one that cause the terrible 1918 flu pandemic. It too evolved into a milder pathogen, and it is still with us today - the 2009 influenza pandemic was caused by a direct descendant of the 1918 virus. The Black Death was so widespread that it even affected human evolution. In 1998, Stephen O'Brien and colleagues showed that a mutation that confers resistance to HIV first appeared in the human population in the 1300's. They concluded that this mutation can best be explained by "a widespread fatal epidemic"; in other words, the Black Death. I should be careful to explain that the plague didn't actually cause the mutation: the mutation occurred naturally. The Black Death selectively killed more people without the mutation, leaving us with a population of humans that tended to have the mutation. In light of these new results about evolution, I can't help pointing out that, finally, that evolution has been in the news recently for another reason. Several U.S. politicians, some campaigning for President, have been attacking evolution, saying that it has "got some gaps in it" and even supporting the teaching of creationism. Scientific facts aren't affected by political statements, of course, but the future of the U.S. is. Politicians who attack evolution, whether from ignorance or from some political or religious agenda, only hurt our future potential as a technology leader. I can only hope that the public won't support these anti-science positions.